mwe3: Tell us about Mysteries Of The Night. 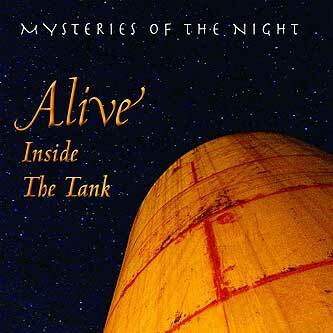 When did you form the group and when did you meet Sarah Gibbons and what did you set out to achieve with the CD release of Alive Inside The Tank? Is this the first Mysteries Of The Night release? James Marienthal: Sarah and I had been playing music together for a couple of years and often experimenting with these flute and voice improvisations. I had been to The Tank and knew that it would be an amazing place to go further with this sound. We set out mainly to just have fun without expectations. It wasnt until I spent many hours listening back to the recordings that I found we had enough good music to release a full album. The name of the group was created after the recording sessions. More than half the CD is from a night session in The Tank when we decided to completely improvise a continuous stream of music for over an hour. The music that came out that night was pure magic. A stream of consciousness channeled from the Great Mystery. The name Mysteries Of The Night came to me as I was listening back to that session, feeling its energy, and being astounded at the depth and cohesiveness of the music that came through that night. mwe3: Youve been on the instrumental New Age music scene for a long time. When did you form Silver Wave Records how many albums has Silver Wave released by you and all the other artists and how do you feel your sound and the entire New Age scene has evolved over the past three decades? James Marienthal: Silver Wave Records officially started in 1986 with the release of Aqua Touch by guitarist Danny Heines. Close to 100 albums followed in the genres of New Age, World Music and contemporary Native American music. Initially, Silver Wave was releasing music that had more rhythm and substance that the meditative music that was dominating the New Age category in the 80s. Our albums were getting airplay in major cities on a commercial radio format known at the time as New Adult Contemporary. We consistently had top ten records on those charts. When that format got saturated and eventually died off we shifted toward world music collaborations and contemporary Native American to continue exploring innovative sounds. I never wanted to let mainstream radio dictate the direction of the label because that would stifle creativity. These days a lot of New Age music is geared toward yoga and sound healing, which is what it evolved from in the first place, but now those things have become more accepted as mainstream, whereas 30 years ago, it was counter culture and alternative market. mwe3: How long have you been playing flute and how many flutes do you have in your collection and how would you compare the flutes that you play on the Mysteries Of The Night CD? Is the Native American flute a lot different from the dual chamber flute and the silver flute? What other instruments to you play and what instrument do you write music on? 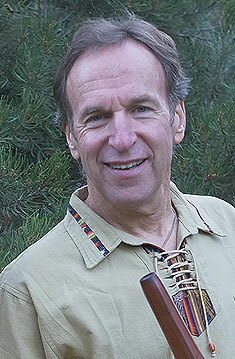 James Marienthal: I have been playing flute for over 40 years. 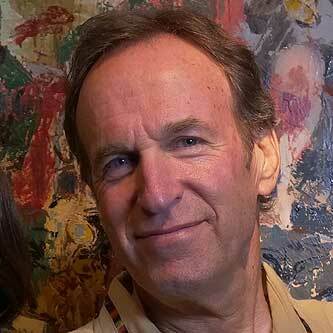 I started music on the piano and I became a jazz fan in college and was learning saxophone. When I left school to travel, I wanted something more portable so I got a silver flute. 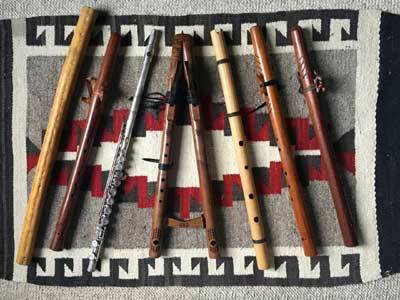 I also got into bamboo flute and the Peruvian flute called a Quena. I came across the Native American flute at an Indian Market and fell in love with it pretty quickly. I now have about 10 of them in different keys and sizes, and made from various kinds of wood. Each one has a unique sound and texture. They are relatively easy to play, compared to other flutes, but it takes time to learn the nuances and bring the unique voice to life in each flute. The dual chamber flute is a Native American flute on one side, and a flute with no holes on the other, which makes a drone. You can blow into both chambers at once and the drone makes beautiful harmonies with notes on the other side. I also play guitar and I like to improvise and compose on piano. mwe3: How long have you been living in Colorado and how would you compare living in Boulder with where you lived / grew up in Chicago? Seems like theres been a large influx of people into states like Colorado and the West Coast. James Marienthal: Ive lived in Colorado for 40 years. At first I settled in a small mountain town because the city no longer appealed to me, then I moved to Boulder years later where Ive been since 1993. Of course Boulder has grown a lot since then, but I dont let the influx of people bother me. Its still a beautiful place to live and it makes sense that more and more people will come to enjoy this beauty and healthy lifestyle near nature and the mountains. And the upside is that there is a bigger community to support music and arts. mwe3: Tell us some of your activities planned for the Summer of 2018. I saw you played at Bhakti Village in Oregon in June. Looks like it will be a blast to say the least. What are your concerts like and where are some of your favorite venues to perform in? James Marienthal: Ive just been on the road for 5 weeks playing at dance and music events, culminating with Bhakti Village in Ashland which was indeed a blast. Ive been focusing my performances not so much as traditional concerts, but more as creating soundscapes for both meditation and movement. I love to play in nature. While I was on the road I played everywhere from the National Parks in Utah to the mountains in California to the lush green duck pond at the city park in Ashland. Its wonderful to play outside and see who shows up to be the audience. Ive gotten some wonderful responses from many people. mwe3: Tell us about the video you did for the Mysteries Of The Night track To The Earth. The Tank seems to be the perfect place to record your flute mixed in with Sarahs vocals. How was The Tank discovered, how long have you known about it and are there ongoing events going on there? James Marienthal: The Tank was discovered as a sound chamber over 30 years ago by a Colorado musician, and started being used under the radar so to speak, for playing music and recording. I found out about it 6 years ago when the only way to get inside was still by crawling through an 18 inch round porthole. 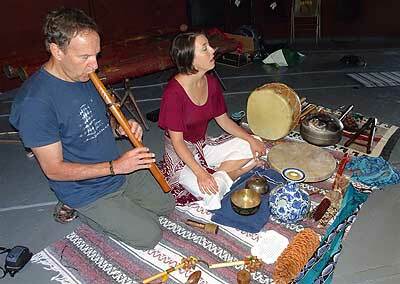 I had an opportunity to spend two hours alone in there experimenting with sounds, playing flute and chanting. It was then I learned how to give each sound a lot of space to truly capture the magic of The Tank. The intro and closing scenes in the video are from some footage I took on my iPad during that first session. The rest of the video was produced by a Boulder video editor who is a collegue of mine and we combined other photos from The Tank as well as night images and nature footage to capture both the ethereal and the earthly vibrations of the music. Through some successful fundraising campaigns, The Tank is now run by a nonprofit called The Tank Center for Sonic Arts. It has been brought up to local safety codes, including a full size door, and is open to the public. There are free open houses on Saturdays in the warmer months, and it can be reserved for recording sessions at reasonable rates. There are ongoing events such as concerts and workshops. All the details can be found at www.tanksounds.org. mwe3: Whats your impression of You Tube and the social media sites like Facebook? Has it all been beneficial for you and the other artists? Seems like the whole online world is still in its infancy in some ways, or in other ways a petulant teenager just coming of age now. James Marienthal: YouTube and Facebook are great venues for sharing and promoting music. I believe it is beneficial and Im working to learn more about how to optimize social media to market music. Its an entirely different business model than what we were doing to sell CD's when Silver Wave was in its heyday in the 1990s. Streaming music started out looking like the death of the music business, and it is close to the death of the CD. But when, once our goal was to sell thousands of CDs, there is now the potential of reaching millions of listeners around the world. The income per stream is minuscule, but multiplied by millions instead of thousands, it has the potential to provide decent income to the artist. So I encourage everyone to go online and listen to our music as much as possible. mwe3: You helped pioneer the whole New Age flute sound with Silver Wave Records going back to the 1990s. I remember writing reviews of Silver Wave albums for over 20 years now. Who inspired you to pick up the flute, who are some of your favorite influences and classic albums and, who are you listening to today as far as ground breaking artists playing flute or New Age music in general? James Marienthal: Silver Wave was certainly instrumental in getting Native American flute music into the mainstream market with the collaborations of pianist Peter Kater and flutist R. Carlos Nakai. R. Carlos was an influence, as well as Mary Youngblood and Tito La Rosa, all Silver Wave artists. Ive also been influenced by jazz musicians such as John Coltrane, Gato Barbieri and Keith Jarrett, as well as folk and indigenous music from other cultures. Today, I listen to so many different kinds of music it is hard to single out any favorite artists or key influences because there are hundreds. Though, on my recent tour I enjoyed some solo artists who were creating intriguing soundscapes with live looping so I am interested in exploring possibilities in that realm. mwe3: What other plans do you have for your music moving forward including new writing, recording, videos, concerts etc. What kind of album would you like to record and release next? 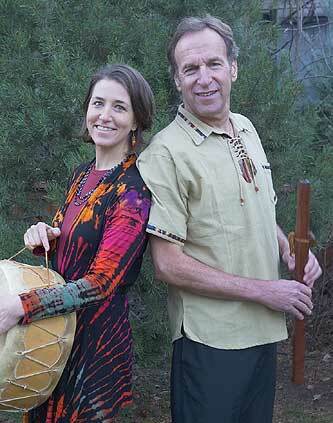 James Marienthal: I recently did a concert in Boulder with percussionist Will Clipman who has played with Nakai for 30 years and a new vocalist; since Gibbons moved on to pursue a different career. It was quite successful so we are considering more collaborations, both performing and recording. On the road I have been playing as a solo artist so Id also like to do an album of my solo flute songs. I have many original tunes that didnt make it on to The Tank album, so Id like to make those available for people who enjoy the solo sound.